I'm writing about Kilauea Volcano in Hawaii today, specifically the Lava Ocean Tour we took in a catamaran to see the lava entering the sea. As usual, I did no research beforehand, having just the vaguest idea of what it comprised - but now that I've done the background reading, I'm more than faintly horrified at how dangerous it had the potential to be. Of course, since it was the US, there was a closely-typed waiver to sign, but (only now) reading it, it was all about tripping over things on the boat. At our briefing beforehand, Captain Shane was more threatening than welcoming - though, as I recall, he focused much more on our personal frailties (bad backs, pregnancy, injuries, nausea) with respect to the roughness of the sea than on anything else. I don't remember him saying, for instance, that we could die. But, it seems that was entirely possible. In the most spectacular way, actually - we did the tour on December 19 and, according to the Hawaii Volcano Observatory website, on the 31st most of the section of the lava delta that we visited collapsed into the sea. I say "visited" - in fact, for half an hour we were bobbing on the sea, surrounded in steam, at times literally no more than 3 metres from where the lava was flowing and spitting (but, luckily I now realise, not generating much in the way of the "flying debris" that the website warns of). And that steam? A cocktail of seawater, hydrochloric acid and fine volcanic particles, apparently. "If the coastguard asks, tell him half a mile," the guide said. Oh, how we laughed! UPDATE: And here in the local paper (and on the TV news, and on Twitter) is what Kilauea is up to right now - super dramatic. It's a 'firehose' of lava shooting out of a lava tube exposed when the section of the lava field that we saw two weeks before, broke off and dropped into the sea. Apparently it was a whole 26 acres of delta that disappeared! Amazing. 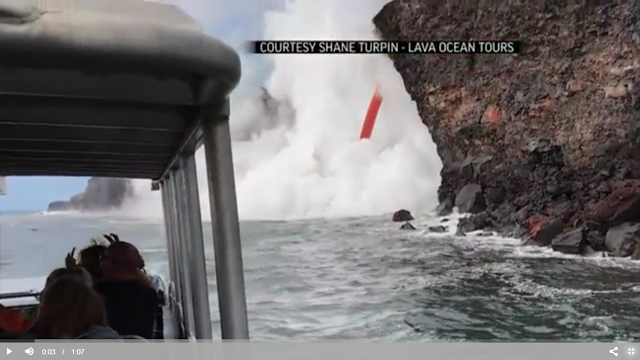 And now there's this steady, uninterrupted flow of lava shooting out of the tube, looking distinctly unreal. And the footage that's being shown was taken by Shane, the captain of the boat that took us on our Ocean Lava Tour, and he's quoted in the story. Connections, people!